1926 In New York, Warner Brothers debuted Don Juan, the first Vitaphone sound film (developed by Bell Telephone Laboratories in 1926) and the first publically-shown 'talkie' with synchronized sound effects and orchestral music (but no dialogue) - starring John Barrymore. 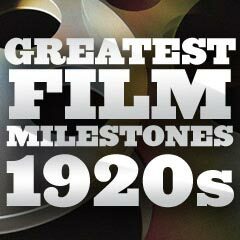 It was the first mainstream film that replaced the traditional use of a live orchestra or organ for the soundtrack (a recorded musical score of the New York Philharmonic), and successfully coordinated audio sound on a recorded disc synchronized to play in conjunction with a projected motion picture. 1926 Russian director Sergei Eisenstein's classic landmark film Potemkin (1925, USSR) (aka Battleship Potemkin or Bronenosets Potyomkin) opened in the US (in New York City in December, 1926). 1926 British director Alfred Hitchcock's first completed and credited feature film, the melodramatic The Pleasure Garden (1925, UK), was released in the US in 1926. The silent film was made after years of Hitchcock serving as a title designer, set designer, writer, and assistant director. It wasn't released in the UK until 1927, after the success of The Lodger (1927, UK). The film told of the divergent life-paths followed by a chorus girl (Patsy Brand) and an aspiring dancer/ingenue (Carmelita Geraghty). 1926 Alfred Hitchcock's second feature film, the 57-minute The Mountain Eagle (1926, UK) remains a "lost film" - the only one in Hitchcock's oeuvre that is missing. All that remains are a collection of dozens of production stills from Hitchcock's own archives. It was released in the US as Fear O' God. The melodrama, filmed in the Austrian Tyrol (a stand-in for Kentucky), starred Nita Naldi - supposedly the new Theda Bara, but the actress never survived the transition to sound talkies. Its tale was about a love quadrangle between Kentucky mountain town shop-keeper Mr. Pettigrew (Bernhard Goetzke), a female teacher named Beatrice (Naldi), Pettigrew's mentally-ill son Edward (John F. Hamilton),, and a hermit with the unlikely name of John "Fear O' God" Fulton (Michael Keen). 1926 The early death of 31 year-old silent screen star and idol Rudolph Valentino (dubbed the "Latin Lover"), noted for 14 films (including The Sheik (1921) and the sequel The Son of the Sheik (1926), and The Four Horsemen of the Apocalypse (1921)) in a short seven-year career, caused a frenzy among his fans during his New York City funeral, attended by over 100,000 people. He died following surgery for a ruptured appendix and gastric ulcers, due to peritonitis. 1926 Uninhibited silent film starlet Clara Bow, known for her sexual exploits, signed a contract with Paramount Studios, but refused to sign the customary "morality" clause. She was offered a contingent $500,000 annual bonus by Paramount, provided that she kept herself free of scandal during its tenure - she failed to collect with numerous affairs, off-screen romances and highly-publicized scandals. 1926 The oldest surviving feature-length animated film (with silhouette animation techniques and color tinting), The Adventures of Prince Achmed (1926, Germ.) (aka Die Abenteuer des Prinzen Achmed), was released in Germany. 1926 Director Robert J. Flaherty's Moana (1926) (aka Moana: A Romance of the South Seas) was released, a Paramount studio-financed, follow-up sequel (of sorts) after his earlier landmark film Nanook of the North (1922) about Eskimo life. The review of the South Seas film by "Moviegoer" John Grierson in the New York Sun was the first time the term "documentary" was used to describe a film ("being a visual account of events in the daily life of a Polynesian youth, has documentary value"). In actuality, it was cinema's first docu-fiction film, reconstructing the traditional life of islanders in Samoa in its semi-fictional tale. 1926 Flesh and the Devil (1926), released late in the year, marked the start of the famous (on and off-screen) romance of Greta Garbo and John Gilbert during Hollywood's Golden Age. It was Garbo's third American silent film for MGM, following The Torrent (1926) (Garbo's US film debut) and The Temptress (1926), and the first of six films she made for preferred director Clarence Brown. The film had three extended love scenes and was reportedly the first Hollywood film with an open-mouthed French kiss between the two stars - who were obviously in love in real-life. It also featured the first-ever horizontal-position kisses in American film. This was the first of four films Garbo made with lover John Gilbert - two of which were directed by Brown (Flesh and the Devil (1926) and A Woman of Affairs (1928)), and two by other directors: Edmund Goulding (Love (1927)) and Rouben Mamoulian (Queen Christina (1933)). 1926 Future star John Wayne (a former prop man) made his debut feature film appearance as an uncredited football player (on the Yale team) in the college comedy-drama, Brown of Harvard (1926). 1926 Actor-producer-star Douglas Fairbanks' ultimate pirate film (silent), The Black Pirate, was historically significant - the adventure swashbuckler was the first full-length blockbuster color film. (The two-color process was first introduced in The Toll of the Sea (1922) - see above, and in some sequences of Ben-Hur: A Tale of the Christ (1925) - also, see above.) It boasted the use of an early experimental Technicolor (two-color) process, although it was also filmed in black and white. 1926 A newer and better recording system for putting synchronized sound-on-film called Movietone was developed by Theodore W. Case and Earl I. Sponable for William Fox of the Fox Film Corporation. In this system, the sound track was placed onto the actual film next to the picture frames, rather than on a separate synchronized disc as in the Vitaphone system.